Megnesite Abrasive Fickerts, Normal Abrasive Fickerts, Diamond Fickerts etc. 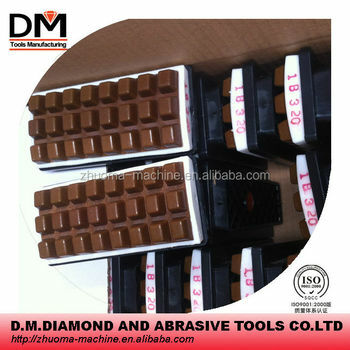 Resin Bond Diamond Abrasive are used on automatic polishing machines to make flexible full-polishing ans semi-polishing on the surfaces of rustic tiles, crystal-effect polished porcelain tiles and glaze tiles. Our resin bond diamond abrasives are approved for their excellent shaping effect, good sharpness, high gloss and long working lifetime. 1. Grinding cost: Less 20% than magnesium oxide fickert . 2. Electricity consurne: Less 50% than magnesium oxide fickert . 3. Glossiness: Higher 10~15deg than magnesium oxide fickert . 4. Abrasive dust: less 400 times than magnesium oxide fickert . 5. Worker Intensity: magnesium oxide fickert.